The annual plant sale is Monday, September 22 – Friday, September 27 from 9AM – 5PM at the NC Coastal Federation Headquarters, 3609 Highway 24, Newport. They are asking for volunteers prior to the sale to help clean and organize the yard readying it for the sale. If you have an an hour or so to give, it would be appreciated. The First Friday PHlocking at the E Club is October 3, where we will have an apple peeling competition. The peeled apples will then be canned for sale at a Breast Cancer Fundraiser. Canning will take place on Saturday October 4th in the morning at Flipperz. Volunteers are needed to help can the apples. If you can spare some time, please contact Renee and Jack Synan or Jessi and Jason Holland. Email Renee at renee.synan@yahoo.com or Jessi at 4jhollands@gmail.com to volunteer. There is also a golf cart being raffled off through Flipperz for the next few weeks with those proceeds as well going for Breast Cancer. Hey Kids! What time is it? Howdy Doody Time!… No. Wait, that’s not right! BEACH BICYCLE POKER TIME!! But to keep all y’all in suspense (ooooh…), let’s recount the events leading up to it. First the crew had to get through our regular PHlocking with a killer combination of a Kentucky Derby/Cinco De Mayo themed gathering; plenty of PHolks dressed up in bizarre costumes to suit both events, lots of “challenging” games (like herding cats with this crew of fun loving PHlockers), laughter, incredible edibles, great tunes from our boys Jack & Dickie along with David sliding in to put a spin on things. Our PHlocking coordinators work hard to make our PHlockings a fun event and we greatly appreciate the time and effort they put in to ensure that everyone has a good time (It’s the Parrot Head way). Of course there was plenty of trash talk about who would win the bike decorating categories in the Poker Run, and some last minute planning and volunteering for the event. We also managed to throw in some donations to the Humane Society, do a 50/50 raffle for the EI Sea Turtle Program, and signed up 27 new members who wanted to join in the fun. Onward to the big event – the world renown Beach Bike Poker Run! With great weather (always have our fingers crossed), we drew a crowd of 169 registrants for this fundraiser, who showed up on decorated bicycles to compete in the bike decorating contest and get ready for a hilarious ride on the Isle. First place in this year’s 3 categories of bike decoration (Cowboy in the Jungle, Growing older but not up, and Boat drinks) came as a sweep to the Hicks clan; James, Jan, and new coming son in law Jason Holland slammed into first place each scoring a $50 gift card donated by Walmart. Not to worry, lots of other category winners in 2nd and 3rd place with good donated prizes and plenty of shoulda/coulda winners out there. The main goal of having fun was obviously reached in this part of the event, so we then unleashed this wild eyed herd of cyclists and some walkers to hit 5 designated stops on the Isle (The Irish Pirate, Emerald Grill, El Zarape, Rucker John’s, and Flipperz) to pick up a card from one of our dedicated “Card Sharks” at each of the stops in hopes of gleaning a good poker hand. A few tumbles here and there (gotta get more practice coordinating that riding) but everyone arrived back at the Emerald Club relatively unscathed and grinning from ear to ear. After some serious deliberation and sorting out 169 completed poker hands, we came up with lucky first, second, and third place winners of $300, $200, and $100 cash awards. At this point in the day, some of the wheels were off the cart and no one really remembers the winning names, but the winners sure did. Thanks to the E Club and the Parrot Head Club for donating these bucks to the winners. Lots of raffle tickets were sold for great prizes generously donated by local merchants and individuals. We’re so lucky to live in a community that supports the Parrot Head Club in our fundraising and partying; THANKS to all, you’re the best! We sure hope you go out of your way to support and patronize them. Door prizes from each of the stops were also drawn, T shirts, beads, and cozies were shot out into the crowd, and Big Dan got everyone dancing and carrying on with his DJ thing. Making sure no one went hungry, the Parrot Heads and the E Club arranged for a spread of tasty grub to cleanse the palate. Many many thanks to the core group of Parrot Head volunteered who pulled everything together to make this happen. A rowdy fun filled time, and BEST OF ALL… WE RAISED $4490 at the event that was all donated to the Hope for the Warriors charity to help support those who have given so much for our country. A very small thank you to a deserving charity that we were proud to be able to make happen by Partying With A Purpose. Another great day in a great place to live. June and July seem to be recuperation time for the Parrot Head Club (aside from our regular PHirst PHriday PHlockings; come on down to The Emerald Club for some laughter, friendship, and rowdy times), but we’ll be doing good things in the community individually during this busy tourist time and will be getting ready for our annual Island Party in August followed by a host of other fun events. In the meantime, say thanks to a Parrot Head for their role in making our community a fun and better place to live, and don’t forget to wish a happy birthday to our crew who were dropped into the world in June of various years. They be: Bill McGowen, Paula Patteson, “Lovely Lois” Harmande, Gary Odle, Brad Bills, Jack “Zack Brown” Synan, Tom Stout, Mickey Henrickson, Ann Stewart, Randy Penny, Gigi Linder, Pam “Turtles” Minnick, Terry Passey, Donna Grady, Gary Pontenberg, Bill “Cap’n Coastie” Gerdsen, Sandy Rockenhauser, Dianne “Mrs. Mayor” Schools, and Tim Hester. If you’re interested go see her. National Parrot Head Convention: Every November (first weekend) the National Parrot Head Organization puts together a convention in Key West that is outstanding and so much fun. Some Emerald Isle Parrot Heads have attended and can vouch for a wonderful experience. 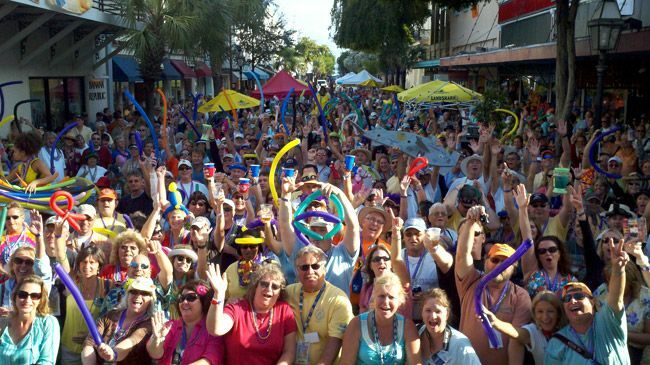 This annual event has live music (of course), street fairs and gatherings of Parrot Heads from around the world! It’s basically a coming home for all Parrot Heads, something to consider at least once. EIPHC Traveling— EIPHC is checking to see who wants to go. Anyone interested? Email Sue Stone at stonesend@gmail.com. Who’s going so far(at this post date) – Our President and first lady Parrot Jan and James Hicks, Bobbie Raub and Jeanne LaVana, Rita Babich, Karin Woodruff and interest from the Stones, Bonnie Forkey, the Dyers and the Potenbergs. The cut off for registration is September 30, 2014 or when they reach 3500. Sign Up – Visit the national web page at PHIP.com and use the drop down list to find MOTM (Meeting of the Minds). They have a different theme every year and this year it is Havana Daydreaming, October 29 – Nov 2, 2014. Let’s PHlock! – September 5 is the First Friday PHlocking at theEmerald Club. The fun starts at 7PM! Music – A Parrot Head Favorite, Scearce and Ketner will be performing live at the Emerald Club! Games – Rumor has it we may be doing the Frozen T-shirt contest so lets hope for some hot weather on PHlocking night. Many of you have done the ALS Bucket challenge, this event has a Parrot Head twist. James Hicks, our Prez, would like to do a group challenge and issue it to Jimmy Buffett. So if you don’t mind a little water to cool you down and want to have an Emerald Isle Parrot Head ALS Bucket Challenge that will hopefu A Cinco Day Mayo good Time! lly make it’s way to Jimmy, come prepared for some laughter. Raffle – Do miss out on this raffle! We are giving away a Tiki God! This treasure has been graciously donated by Vern and Karen Geddings. We will be selling raffle tickets at the PHlocking and at the Sand Bar Party on Sunday September 7. The drawing will be held at the Sand Bar Party. You do not have to be present to win, but make sure we can get in touch with you. If we don’t have a way to contact you, we will draw another name. Proceeds will go to a local charity chosen by Vern and Karen. Eats – Come hungry, the food is free!